What was your last tobacco purchase? Re: What was your last tobacco purchase? 8 ounce bag of Penzance. Local cigar shop carried a couple of 4TH Gen tins so to support them I picked up this. Got my 1st tin of GL Pease Stonehenge Flake w/ my order of Pease Embaracdero tins. Not sure I much like Stonehenge. Most of my cellar remains in the States, but I occasionally have a few tins brought down....but I got a special treat recently. A Dominican friend gave me about a pound of Andullo, a Dominican tobacco that has been compressed in thatch tubes called yaguas. The result is deeply pungent and quite potent - too much so for me. I've been mixing it into other things to experiment. It works similarly to perique in that it plays nicely in small doses with Virginias. Nothing world-changing so far, but worth trying just for the experience I reckon. 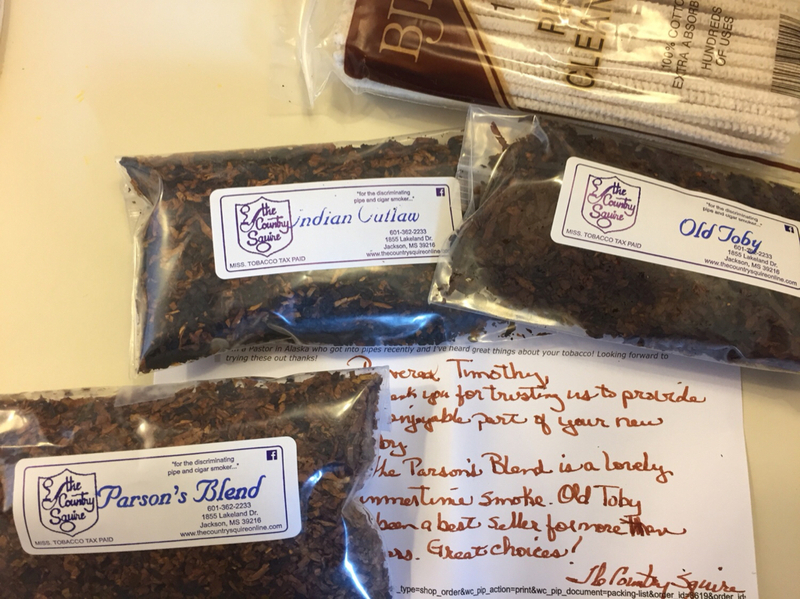 Heard a lot of great things about Country Squire so I picked up a few of their blends. Some Old Toby because I’m a big LOTR fan, some Parson’s Blend because I’m a Pastor and some Indian Outlaw because I’m part Native American! AKPreacher wrote: Heard a lot of great things about Country Squire so I picked up a few of their blends. I've perused their house blends on their website a few times now, but never ordered from them. I listen to their podcast regularly and enjoy it quite a bit - I remember JD likening Shepherd's Pie to Frog Morton, and Hunting Creek was compared to Frog Morton's Cellar. On land, on sea, at home, abroad, I smoke my pipe and worship God. Will be ordering a couple more 500g boxes of Gawith, Hoggarth, & Co. Brown Flake (unscented) from 4Noggins soon as I'm down to my last 1/2 pint jar. It's my very 1st bowl in the morning everyday, so I go through a lot of it. Be nice if 4Ns could throw up another of their rare 10% off sales to save a few bucks. a couple more 500g boxes of Gawith, Hoggarth, & Co. Brown Flake (unscented) from 4Noggins. I go through this great stuff faster than a hungry black bear ravages wild honey, except w/o the stings. Goose55 wrote: a couple more 500g boxes of Gawith, Hoggarth, & Co. Brown Flake (unscented) from 4Noggins. I go through this great stuff faster than a hungry black bear ravages wild honey, except w/o the stings. I just added that to my wish list. The description at tobaccoreviews.com looks good. Been wanting to try this for awhile now, got two as I don’t often see it in stock and figure worse case scenario it would be good trade fodder if I didn’t care for it. 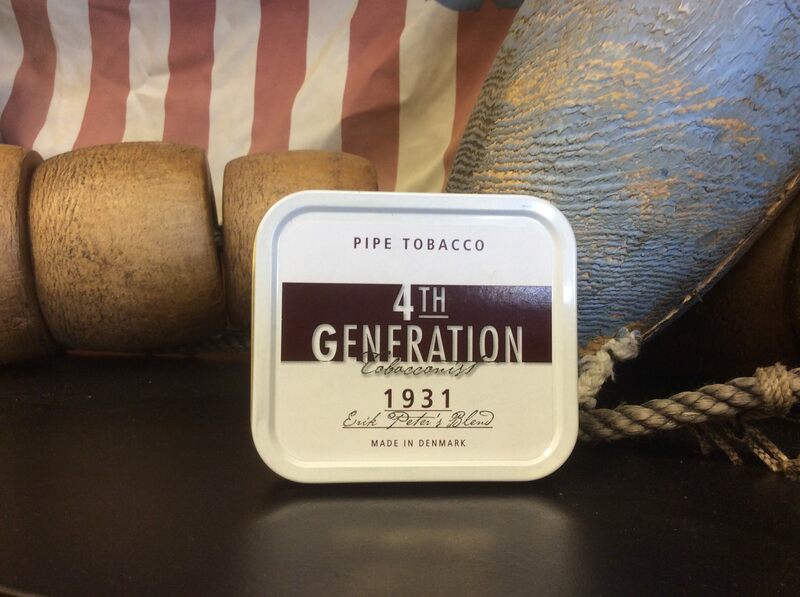 Ordered 3 tins of Squadron Leader Special Edition with Perique from SmokingPipes this morning. Looking forward to trying this. Really interested in what you think of the Rivendell.